Who will be crowned champion at WrestleMania? WWE WrestleMania 35 is shaping up to be a hell of a night. A host of great matches are already announced for the Show of Shows. Adding to them a range of other speculated ones will make it a breathtaking night for sure. Batista's return to the squared circle and Kurt Angle's retirement match are engaging enough for WWE Universe to stick around for the show. A great job has been done by WWE in order to build two of the biggest WrestleMania 35 matches. Becky Lynch's never compromising attitude and Kingston's resolute for greatness has done a great job in developing what will be a picturesque night at the MetLife Stadium in New Jersey. Another big match announced for the show is Seth Rollins vs Brock Lesnar for the WWE Universal Championship. Though it has been criminally built with no sign of Brock Lesnar, it still owes all the potential to be a show-stealer with Rollins going in the match as the red hot babyface. WWE booked three similar kinds of storylines for the Grandest Stage of Them All with very less contrast between them. While Kofi Kingston is yet to officially book his ticket to Mania, he'll have his chance in the coming week's SmackDown Live in a gauntlet match. 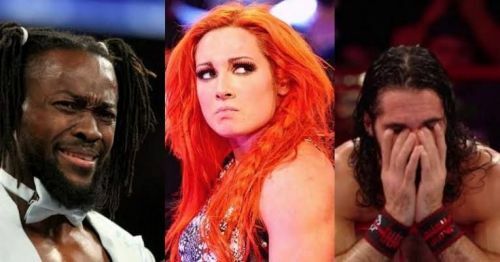 Becky Lynch, Kofi and to a certain extent Seth Rollins also overcame a lot of odds to reach here. All three of them were portrayed as underdogs of their respective storylines. WWE did their job to perfection by giving fans what they want as promised in the shake-up by Vince McMahon himself. All three of them winning the title will be a moment for fans to cherish for long time. But this situation may not go well with WWE Management. There were reports emerging a few weeks back that one of three is set to lose the title match. As of now, it is hard to speculate who that unlucky Superstar could be. One thing is for sure all of them stand equally popular in the eyes of fans. Anyone of them losing early in the night can start an instant backlash from fans in the attendance. It can end up leaving a very hostile environment for the rest of the card. If WWE decides to put that losing babyface at the end it will surely leave a very sore impression on the entire show. Honestly speaking, giving titles to all three babyfaces cannot be a solution. WrestleMania is a tirelessly long night, therefore, fans do not remain pumped up for the entire show. A moment of such stature early in the night can exhaust all of their energy which can ruin the moment coming later in the night. Thus WWE has landed themselves in a heap of trouble by giving fans what they want at WrestleMania 35 with no way for them to go left.